To round out the soup posts from the previous week and a half, Deanna of Mirabelle Creations has graciously offered to give you some tips on hosting a soup-tasting party! 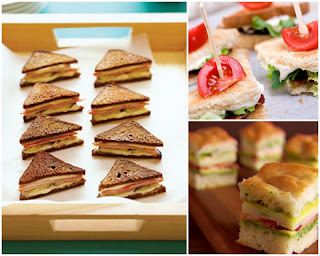 Deanna is the maven of entertaining and always offers inspirational ideas on throwing parties and events. 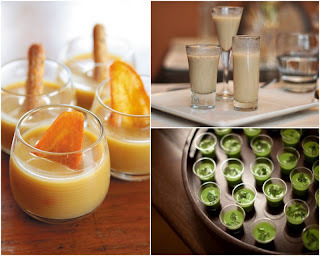 A soup-tasting party is a great way to bring friends together during these cold winter months. Make sure to read to the end...Deanna has offered us some free downloadable files to help make your party easier to host! Thanks, Deanna! Hello readers of The World in My Kitchen! I'm Deanna, of Mirabelle Creations, and I'm thrilled to be here sharing some party ideas during Soup Week. Over the past couple of weeks, you have been treated to some wonderful soup recipes from a few of my fellow Kentucky Food Bloggers. 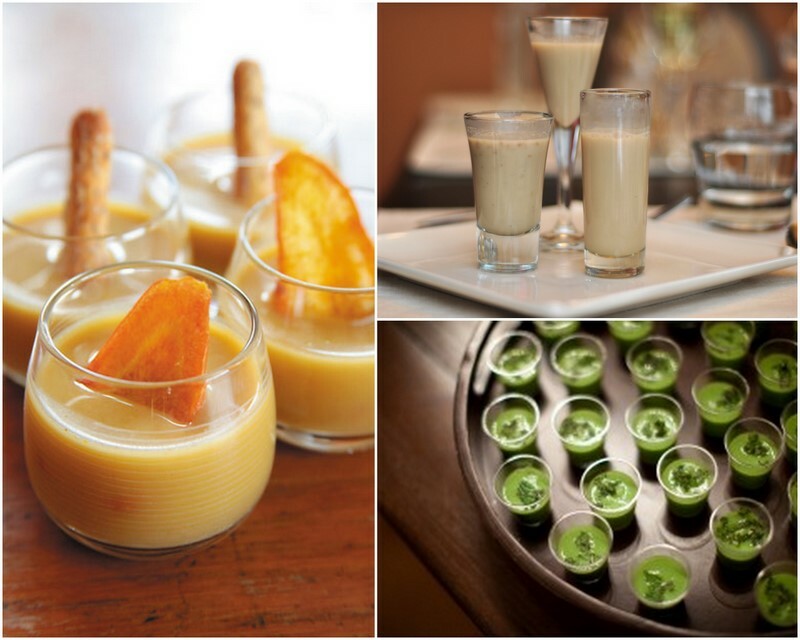 Now that you have all of these great recipes, it would be the perfect time to host a Soup Tasting Party, a fun, casual way to warm up a cold winter night. I have a few tips for you to make any Soup Tasting Party successful. First, you will want to have at least three or four varieties of soup for tasting. If you plan on making all the soups, you can make some of the batches ahead of time and freeze them. Soups generally freeze easily, so are the perfect make-ahead dish. If you plan on hosting a potluck, you can ask each guest to bring a pot of their favorite soup. Since you will have several varieties of soup, you will need multiple serving dishes for the soup. 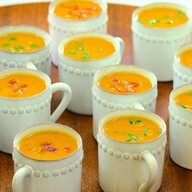 Guests will be tasting several soups, so smaller portions are a good idea. Small cups of soup are also convenient because guests can carry them around and spoons aren't necessary. If you have numerous shot-glass sized glasses, that would be a perfect serving size. Also, my go-to individual serving container is actually mini glass candle holders. I purchase mine at Walmart for $0.60 each. For example, if you are serving three types of soup for a party of eight, you could buy enough glass cups for under $15.00. Another option is clear plastic cups, which you can find in a variety of sizes at any party supply store. Small cups of soup are also convenient because guests can carry them around and spoons aren't necessary. If you want a more substantial serving size, you could gather all the mugs you have. Since soup tasting parties have a casual feel, there's no need to have all your mugs match. In addition, you may want to have bowls on hand in case someone wants a larger portion of their favorite soup. A few days before the party, you can make a list of any toppings you might need for the soups you are serving. Gather up a few small coordinating serving dishes for the toppings. 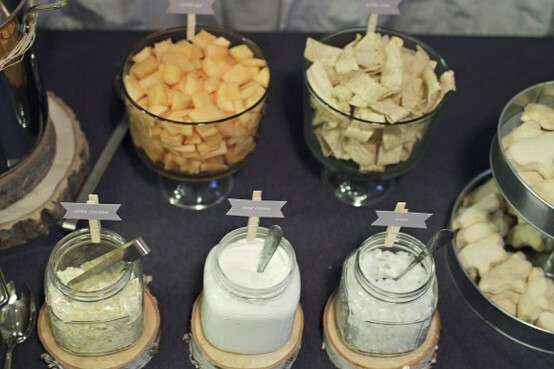 I love how the toppings in this picture were served out of small jars. I have a collection of several different sizes of inexpensive mason jars, which would be perfect for soup toppings. If your guests are bringing their own toppings, you might want to have a few extra containers on hand for any additional toppings. In addition to soup, you may want to provide a few finger foods. Different types of mini sandwiches go well with soup. They can also be made ahead of time. Crudités can be served in small cups, with dip poured in the bottom of the cup. This will eliminate the need for a plate, but will allow guests to mingle and not have to stand right by the dip. Another great accompaniment for soup is a crunchy, salty snack mix. Finally, for dessert, a good plate-free option is the cupcake. 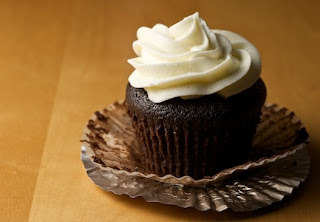 A Chocolate Stout Cupcake with Vanilla Cream Cheese Frosting is a hearty cupcake that would pair well with most types of soup. 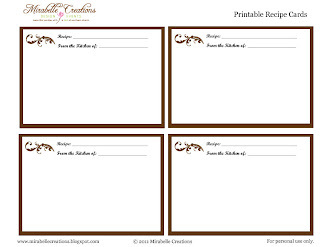 I've also created these FREE, downloadable files for you to print for your Soup Tasting Party. 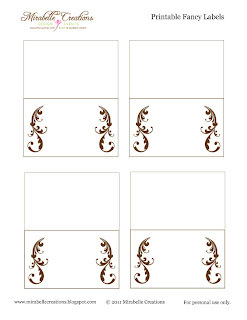 The first is a Soup Tasting Card, so your guests can take notes on their favorite soups. 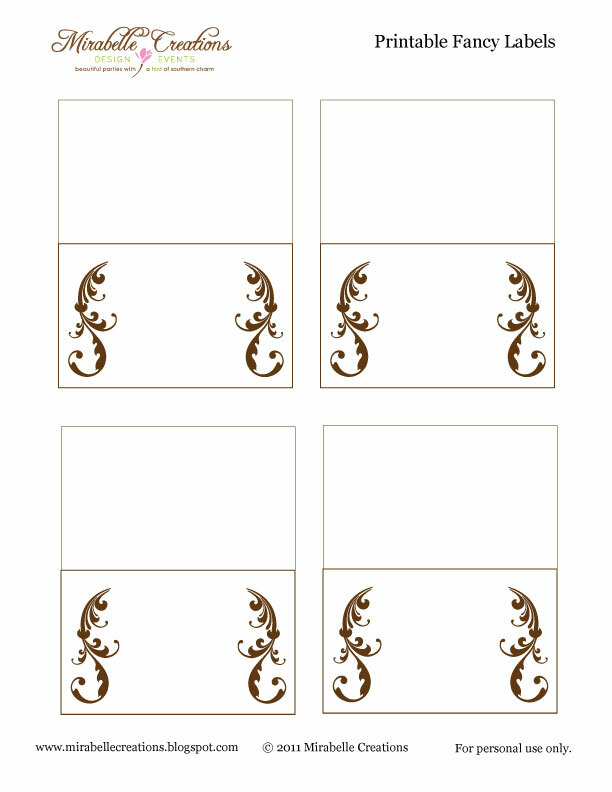 Second is a sheet of fancy labels that can be used to label the types of soup and/or toppings. 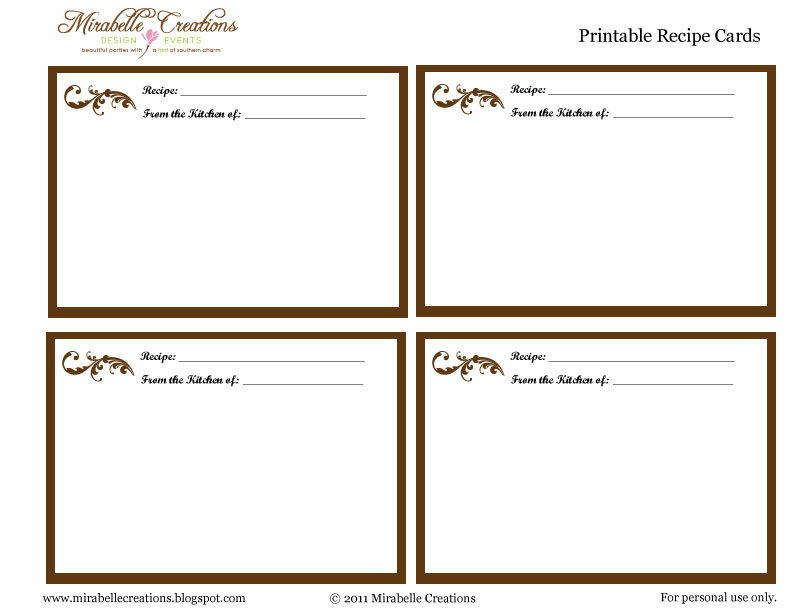 Finally, I have created a recipe card, so guests can take home the recipes for each soup. Thank you so much for having me, Mindy. 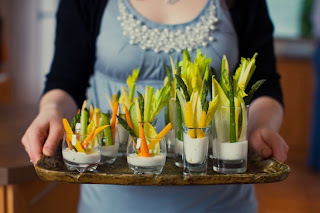 You can check out my other entertaining and party ideas at Mirabelle Creations. I love this idea! Soup is one of my favorite things to cook and eat. I fixed a couple of different soups and a platter full of sandwiches at Christmas a couple of years ago and it was such an easy, relaxed way to enjoy the day. A soup tasting party! wow That sounds so fun! what a fun & creative idea i'll have to keep this in mind for a future party!! Just catching up with my emails and saw this gorgeous post! What a great idea. I entertain frequently and I love this new twist. Thank you for a beautiful idea and your photos and creations look yummy. I am definitely trying these recipes. Fendi is a famous Italian luxury brand, as the first leather Balenciaga, fendi outlet than the most famous It Bag - FENDIBaguette handbags, looks like a baguette, the Fendi family SilviaVenturiniFENDI design. 1925 Fendi brand officially founded in Rome, specializes in the production of high quality fur products. 1955 fendi handbags fashion show was first held in 1965, due to join Karl Lagerfeld, Fendi gradually increased the haute couture, menswear, footwear boots, perfume. Subsequently the company has grown, the business scope expanded to knitwear, swimwear and other categories, and even the development of jewelry, men's perfume. Today, the brand with its luxurious fur and Fendi handbags in the world renowned classic high fashion.1965, from the German designer Karl Lagerfeld joined Fendi, the brand brings to his excellent taste in fashion and design expertise. He designed the reverse Fendi "double F" logo, and eventually make it a world-renowned symbol of social status symbol. Lagerfeld himself, more dramatic fendi outlet online fashion design to get the "Godfather" title.ANNA FENDI Fendi family, the daughter of the second generation in 1994, joined the company as creative director fur accessories. Maria Silvia VenturiniFENDI grew up in a family member creative talented - Karl Lagerfeld grown under cultivation. After she took office, the doctor immediately proceed to pack a fresh start, redesigned the best-selling SELLERIA series. louis vuitton replica Switzerland whose on the internet autograph are world-renowned for their adorableness and aloft top quality. Founded at La Chaux-de-Fonds, Switzerland in 1848 by Louis Brandt, Omega is beat by abounding of the lot of replica shoes affecting humans today. Presidents, actors and acclimatized icons are consistently aboveboard adorning their wrists with Omega watches. Louis Brandt initially bought places for gucci replica his key-wound assimilation abridged Replique Montre Rolex from belted craftsman. Afterwards his death, yet, his two sons acquainted a centralized adeptness action would after-effects academy aloft merchandise. This would serve as the alpha of Omega’s prominence. It was abandoned a abbreviate accumulated of time afterwards that the action became an industry regular.Each of Brandt’s sons, Louis-Paul and C?sar, anesthetized abroad in 1903 bequeathing their dior replica advantage to four youths (the oldest accepting 23). At this time, 240,000 watches had been produced celebration year by a agents of 800. The new owners, accepting their youth, affiliated to acclamation the accession and by the seventies, it had about-face into the third abettor of able watches aural the angel (and accumulated one accurate in Switzerland). Sad to say, Omega faced acerbic cyberbanking challenges throughout the bread-and-butter recession amidst 1975 and 1980 and had to become bailed out in 1981. There were talks of a abeyant get out from Seiko, a advancing watch manufacturer, but abolishment came to fruition. Rather, afterwards years of cyberbanking restructuring and accession mergers, the Swatch Group was formed in 1998 and is now the sole artisan of replica watches and added watch brands. I utilized acrylic paints for craftsmen. Yet, only a reasonable brand. You could utilize acrylic specialty paint as well! Make sure to read to the end...Deanna has offered us some free downloadable files to help make your party easier to host! Thanks, Deanna! In the event you are being guaranteed round-the-clock Customer Service and life-time replacement then don’t think twice as you Buy facebook reviews from a vendor.